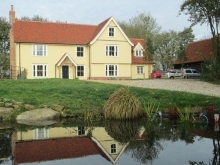 The project involved the demolition of an existing house and the construction of a new timber frame house and garage to provide accommodation for a family of six. The house was designed using traditional vernacular materials for this part of Essex and the sloping site on the edge of a small village provided a wonderful opportunity to maximise the potential for views across the countryside. 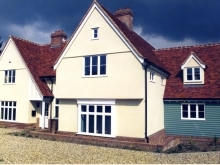 The house was built to a high standard of insulation with underfloor heating to all floors and a heat recovery system. 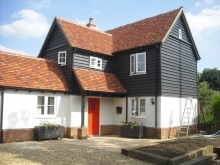 It also accommodated traditional design features including chimneys, purpose-made windows and doors, and oak floors. The site offered good views across the valley to the north and, therefore, the principle bedrooms were located on the north side. However, to ensure sunlight penetration to the house, the design incorporated a double height entrance hall with a large south facing window.